ADJUSTABLE MAGNIFICATION:spotting scope with variable 15x to 45x zoom magnification and 60mm objective lens, dynamic lens focusing system makes it easy to zoom in on target. PRACTICABILITY: features 45 degree angled eyepieces for easier observing, and a twist-up sunshade to help reduce the glare and shield the objective lens; the 16 mm eye relief allows a comfortable viewing for eyeglass wearers. 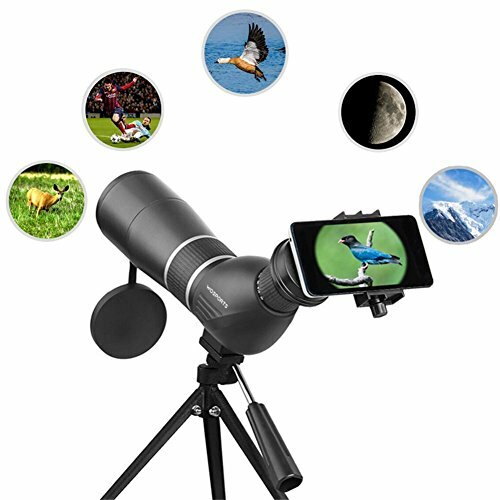 EASY TO USE: Comes with a digiscoping cell phone adapter - which enables you to take videos and images in the distant world. Explore the nature of the world easily through your screen. WATERPROOF DESIGN: O-ring seals prevent moisture, dust and debris from penetrating thescope for reliable performance in all environments, and nitrogen gas purging delivers further waterproof performance. WIDE RANGE OF USES:Great for bird watching, ship spotting,sightseeing,climbing traveling, sport Game,concerts etc,Great gift and BEST CHOICE for a Friend and Myself. If you have any questions about this product by Wosports, contact us by completing and submitting the form below. If you are looking for a specif part number, please include it with your message.